Socialist Francois Hollande has been elected France's new president, according to early estimates. Socialist Francois Hollande has been elected as France's new president, according to early estimates cited by the BBC. According to projections based on partial results, Hollande got about 52% of the votes in Sunday's run-off, against 48% for center-right incumbent Nicolas Sarkozy. Hollande would be France's first socialist president since 1995. The Associated Press said that Sarkozy "faced voters' anger over austerity" and that the election is expected to have far-reaching economic consequences for Europe and to affect France's military and diplomatic posture internationally. "Exuberant" crowds gathered at the Socialist Party headquarters in Paris even before the official results started coming in. 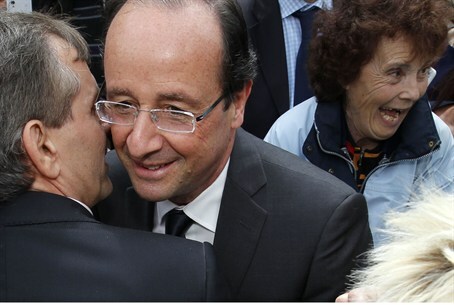 Hollande voted in his electoral fiefdom of Tulle in central France. French law bars the publication of results before all polling stations have closed to avoid affecting the outcome. Hollande has promised to raise taxes on big corporations and on people earning more than 1 million euros annually. He also wants to raise the minimum wage.